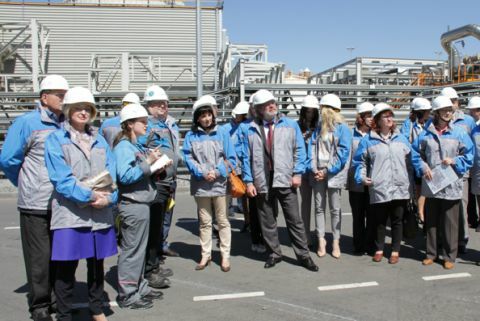 The deputies of the Nizhny Novgorod region’s legislative assembly held an on-site meeting and visited the active production of polyvinyl chloride (PVC) – modern synthetic polymer, falling within the category of basic polymers, which is in rising demand in the Russian market, on May,25. The main objective is to evaluate the efficiency of the investment legislation, effective in the Nizhny Novgorod region, at a particular example. The opening ceremony of RusVinyl LLC’s PVC production complex was held in September, 2014. The enterprise was built according to the most up-to-date European technologies (BAT – Best Available Techniques), ensuring production of required range of PVC grades with low production costs and mandatory conformity with the most strict environmental protection requirements of Russia. The plant’s design capacities are 300 k tons of suspension PVC, 30 k tons of emulsion PVC and 225 k tons of caustic soda. Construction of this plant became the largest investment project in the Nizhny Novgorod region, and the enterprise acquired the title of the most high-tech in its category in Russia. As a result it was considered as the priority one at the level of the Nizhny Novgorod region’s government, it was included in the RF’s Trade and Industry Ministry’s long-term program of strategic development of the petrochemical industry, as well as in the list of key investment projects of the plan of the RF’s gas and petrochemistry development till 2030. Today’s meeting participants have remarked that new production enterprise gives a strong impetus to the Nizhny Novgorod region’s economy, in particular to the development of chemical sector. The enterprise’s output products cover about 30% of the Russian market’s need, and reduce the import of equivalent products. «It is quite comfortable to work in the Nizhny Novgorod region, -said RusVinyl LLC’s CEO, Guenther Nadolny.- We receive state support in the form of tax benefits and partial compensation of interest rate for credits, attracted within project financing. Besides, the region’s geographic location is quite advantageous, enabling to create and implement convenient supply chain schemes. Of course, further development depends on the market condition. We will see how the economic recession will influence our final product. However, in general we are optimistic, as PVC is a promising polymer, which will bring good financial results to our enterprise as well as to the entire Nizhny Novgorod region. Currently, the enterprise load is 80%, however in the coming months it is planned to reach 100% of capacities. «At the example of RusVinyl, the efficiency of our regional legislation in the field of supporting large-scale investment projects is being worked out, - said Deputy Chairman of the Legislative Assembly, Alexander Tabachnikov. It is not our first visit to this enterprise. By now we have received full replies to the questions, we had during previous visits. The enterprise is functioning as per the schedule,that was previously stated. As a deputy and citizen of the Nizhny Novgorod region I welcome the arrival of powerful high-tech investors in our region. The legislative assembly provides all necessary support».